How Flexible Is Your Succession Plan? Top leader succession is often front-page news. Consider Citigroup’s Charles Prince’s resignation in November 2007 or Mark Hurd’s exit from Hewlett-Packard in August 2010. Leadership succession grabs headlines because changes at the top create turmoil and uncertainty, whether the company is a multinational corporation or a small family-run enterprise. Yet few companies are prepared to deal with the sudden loss of key leaders. In a January 2011 survey of 1,098 managers by the American Management Association, just 14 percent said their organization is “well prepared” for an unexpected change in the senior management team (Figure 1). CEO succession is important, and today’s organizations need to reach deeper into the business to develop strategies for succession planning to ensure leadership development is built around a broad range of management positions. Doing so will help insulate them against unpredictable business disruptions due to changing economic conditions or sudden departures. It also can prepare them for changes wrought by demographic shifts that are more predictable, yet just as disruptive. Half a century ago assigning key leadership positions to white males who worked their way up through the ranks made sense to shareholders because they saw the appointments as accurate representations of the workforce. Today’s leaders must represent a cultural, ethnic and generational mosaic. Diverse experiences in the workplace offer perspectives that homogeneity cannot match. A 2007 analysis published in the Journal of Management found that broad diversity of personal and work-related attributes had a statistically relevant impact on workplace productivity. Companies are increasingly judged by their ability to do more with less, and to execute faster and more nimbly. Also, their ranks are changing. Today’s workforce looks different from a decade ago, and tomorrow’s likely will look different than today’s. Consider the looming retirement of baby boomers — the 77 million workers born between 1946 and 1964. For the next 19 years, baby boomers are expected to retire at an average rate of 10,000 every day, according to the Bureau of Labor Statistics (BLS). Since millions of these workers hold management positions, their employers will be looking for qualified replacements. These retirees will leave with more than a gold watch: they’ll take essential experience, knowledge, perspective and wisdom along with them. The prospect of losing so much talent has forced leaders to focus on more comprehensive succession planning. Replacing baby boomers will involve more than simply slotting someone new into a freshly vacated management post. Younger workers operate under different work-life values and expectations. A 2011 study funded by a grant from the Social Sciences and Humanities Research Council of Canada found stark differences in work priorities among the workers expected to replace boomers: the Generation Xers (born between 1965 and 1979) and the millennials (born in 1980 or later). Two differences stand out. First, workers are changing jobs with greater frequency. In 2010, the BLS estimated the average worker born between 1957 and 1964 will change jobs 11 times. Many analysts believe half of the U.S. workforce eventually will be made up of contingent workers, such as part-time employees, consultants or independent contractors. Achieving stability in such a dynamic environment will require organizations to provide greater opportunities for internal movement to prevent voluntary turnover of key talent. Second, Generation X employees demonstrated the lowest job satisfaction among all demographic segments while simultaneously balancing the greatest conflict between work life and family life. Equally important is the accelerating change in the required skills and experiences that best predict future leadership effectiveness. Next-generation leaders must be able to quickly discern the impact of globalization or the influence of disruptive technologies such as mobile or social computing on business strategies. Therefore, today’s succession planning strategies require flexibility. They need to be flexible when evaluating candidates for leadership, looking not just at what has proven successful in the past but what may be needed in the future. The more flexible a company is in grooming and selecting its leaders, the better it can respond to market forces. United Airlines has benefited from a flexible succession and development environment. Facing challenges including terrorism, pandemics, escalating fuel prices and bankruptcy, United made significant layoffs. Between 2000 and 2010, it lost half its employees. “We really needed good, strong leadership to help employees overcome their feelings of frustration and uncertainty for their future at the company,” said Greg Grogan, former director of HR technology at United Airlines. In its succession planning process, United obtained information about employee performance, competency ratings, personal goals and career aspirations, and combined it with 360-degree feedback. Senior leaders took time with each individual to understand that candidate’s prospects within the executive-level talent pool. They were able to identify potential successors and interim successors for every position, ensuring no essential post is long vacant. The company then assessed any competency gaps in potential successors and created development plans to ensure those individuals were ready. Today United has a pool of more than 250 potential successors for 45 top positions who have been identified not by old-school management doctrine, but by a flexible succession methodology that assesses individual strengths and competencies and uses learning and development to close competency gaps to ensure a broader, more diverse population of leaders is ready to step up. Companies such as United Airlines have learned that, rather than define a single perfect candidate, it’s more sustainable and effective to create succession pools with multiple candidates and career development strategies. That requires managing a diverse talent bench, for which organizations need three key elements: the talent profile, talent pools and development plans (Figure 2). These elements, combined with key capabilities such as internal mobility, external talent sourcing and robust feedback channels to support endorsement of new leaders, are the bedrock of a framework that guarantees diversity in leadership succession. None can be sacrificed for the others. Developing future leaders from alternative career paths is just as crucial as the ability to identify external candidates who already hold a similar post in another company. The talent profile: Some aspects of succession look a lot like recruiting, particularly those that evaluate talent for fit in a given role or create a sufficient pipeline of capable candidates for potential openings. As technology gets better at delivering what people want, leaders have to seek diversity of perspective and new ideas. Diversity isn’t just a buzzword or legal requirement; it’s a key business enabler with well-researched impacts on innovation, creativity and productivity. To see value in diversity, companies need to move beyond what’s legally required to a broader, more nuanced view that includes diversity in perspective, experiences, competencies, personality and culture. This requires a change in workplace culture, one that must be communicated and evangelized from the top down and embraced from the bottom up. A robust talent profile can be an effective tool to capture and promote this view of diversity. The more intelligent or data-rich the talent profile, the better. Key elements of intelligent talent profiles include aggregation of work-related and non-work-related skills. Finally, talent profiles serve as a kind of digital billboard of a candidate’s accomplishments that span a career. They belong to individuals as much as to the organizations that use them to assess and compare talent from both inside and outside of the organization. And by serving as the always-current container for a holistic view of an individual, intelligent talent profiles offer a powerful tool to understand the breadth of a candidate’s proven and potential contributions. In this way, they support efforts to live up to the broader view of organizational diversity. Talent pools: Traditional definitions of talent pools often cite a talent pipeline that has sufficient volumes of candidates available for consideration when a specific position becomes vacant. In succession planning, however, talent pools are vehicles that ensure visibility to groupings of key skills or capabilities, which can include internal and external talent. Examples of talent pools might include “MBAs who code in Java” or “sales managers with financial acumen.” An interesting aspect of managing next-generation talent via pools is that successors for critical roles can come from multiple talent pools, and individuals themselves can be tagged in multiple pools. This many-to-many approach promotes multi-dimensional diversity by viewing potential leaders in terms of valued strengths and experience, and by offering an opportunity to identify high-potential minority leaders who might meet several criteria across strengths, skills and experience. Diversity is about maintaining a balance between specific team needs and the overall mix of leadership capabilities within an organization — the talent bench. This is an area where diversity executives must be in constant communication with other managers, and where the broader organizational diversity perspective can be particularly valuable. The perfect successor for a given role on a given team may not be the perfect choice in terms of organizational balance and diversity. This is another reason why talent pools are more effective than pipelines. With deep and broad talent pools for given roles, it’s possible to balance organizational diversity needs — such as the need for an executive who can engage Spanish-speaking Latino workers or one who can mentor female employees — without sacrificing talent depth and quality. Development plans: For many organizations, one central challenge is having enough of the right people ready at the right time within a given succession pool. Development planning solutions provide critical features to overcome this obstacle. Increasingly, development plans are incorporating formal and informal learning. For example, sending a senior quality assurance engineer with management aspirations to a project management course is one thing. But allowing her to participate in a new product launch could provide critical, on-the-job experiences that will help define her future success. Experiences like these, even though they fall outside traditional development courses, can strengthen a high-potential, diverse employee’s advancement chances. BIC, a global maker of pens, shavers, lighters and other products, found a comprehensive approach to development planning is critical to ensure talent pools include the most diverse population of tomorrow’s leaders. Manuel Martinez, director of HR development at BIC, travels every month and engages constantly with employees in multiple locations. Development capabilities also provide key feedback points with which to make better decisions about possible successors for a given role. An employee’s training history and certifications are important, but feedback on whether a new leader has the confidence of the organization provides a new set of data for analysis and determination of fit. Here, the talent profile also plays a crucial role, since it includes feedback that managers and colleagues provide on the employee — feedback that can be collected continuously via online talent management products. Development planning also helps create lifelong learners. As Peter Senge noted in his 1990 book The Fifth Discipline, organizations aiming to survive and thrive amid an ever more rapidly changing business environment must embrace continuous learning as a cultural norm. A slew of research has proved this connection by finding business impact correlations between learning and development among senior leaders and company performance. By tracking self-initiated development opportunities, learning solutions can help identify individuals with a learning mindset. Learning and development solutions also can provide mechanisms to increase the pool of successors. These solutions provide tools to develop marginal candidates who may have great promise but must gain specific knowledge or competency, or must close an experience gap, to develop into viable successors. As the breadth of the individual’s experience, knowledge and skill set grows, so does the talent pool. Business in the 21st century is mobile, social and global, and the rules of engagement are changing faster than ever. To meet the rigor of future competition, organizations need to develop succession planning strategies that embrace uncertainty. They cannot predict exactly what combination of skills and experiences will define readiness for the next generation of leaders. 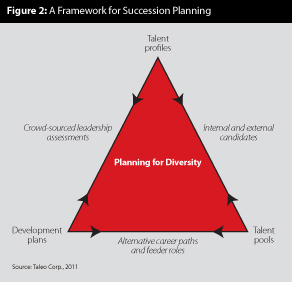 The framework that supports diversity in succession planning is built around an ability to use talent profiles, talent pools and development planning capabilities that, by their very nature, provide a lens into diversity for potential successors. These elements, combined with best practices around talent sourcing, learning initiatives and performance assessment, will help individuals and the organizations they work for prepare to take on an uncertain future. Karl Ederle is vice president of product strategy at Taleo, a talent management services provider. He can be reached at editor@diversity-executive.com. Next PostNext Whoa, Whoa: You Want My Facebook Login?